Want to make a craft with the kids that you will cherish for years to come? Check this out! You can make a handprint flower keychain with a few simple supplies. Pro Tip: Clear Shrink Film works best for this project! You will want to do this craft outside or in an area that you can easily clean. You can never be too careful when you’re painting the hands of little ones. I covered my kitchen counter in newspaper so that I was close to the sink for cleanup. First you will lay out a sheet of your shrinky dink paper on a dry surface. Squeeze out equal amounts of red, pink and green paint onto a paper plate. Here comes the fun part! Take the paintbrush and coat your child’s hand in red paint. You don’t want the paint to be so thick that it’s dripping, just enough to make a nice handprint on your shrinky dink sheet. Guide your child’s hand to the shrinky dink paper and help them press firmly and lift right up. Be careful not to let their hand move around or you will smear your print. Let the red print dry before following the same steps to create the pink handprint. Invite your child to paint a green stem and a few leaves or you may do this step yourself. 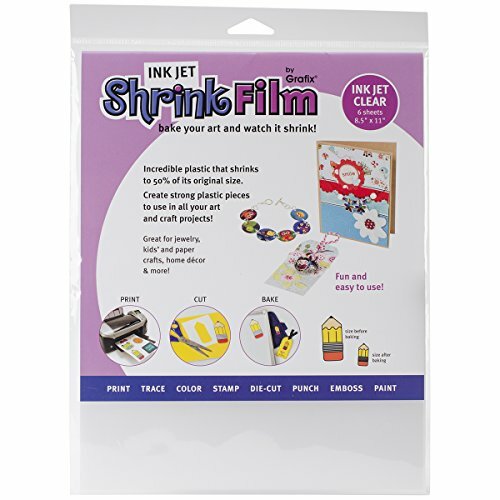 Allow the entire sheet of shrinky dink to dry completely before cutting out with scissors. Before baking your shrinky dink, don’t forget to use a hole punch to create the hole you will place the key ring through. If you forget, you won’t be able to create a hole later. Bake your shrinky dink sheet according to the directions on the back of your package. Oven temperatures and time will vary depending on brand of paper that you use. I used my toaster oven and set it around 350 degrees for 2 minutes. It’s normal for shrinky dink to curl up during the baking process. They will flatten out as they finish cooking. If your keychain has a curl after it’s done shrinking, use a spatula to press your keychain flat immediately. After your keychain has cooled you will seal it with a matte sealer spray or mod podge . Place your key ring onto your child’s little work or art and there ya have it! A beautiful Mother’s Day gift and keepsake. Not a fan of keychains? Skip the hole punch and add a magnet to the back to display it on your fridge!